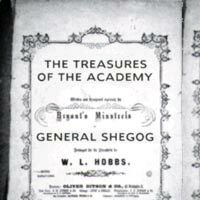 Remember General Shegog's poem, Treasures of the Academy? The last lines of the poem, included below, give a clue to the location of the treasure, which is also the location of the lost Kudzu kids. Shall go wandering right at the den of Stark's Bait. And if he put God first, then turn the other cheek. You will die if my academy's treasure disappears. Do you now know where the missing Kudzu Kids are? Click Solve the Case above. Want a little more help? Click Give Me Another Hint above.